R. Merton published a seminal paper  that laid the foundation for the development of structural credit risk models. In this post, we’re going to provide an example of how it can be used for managing credit risks. where denotes the volatility of equity. Having the credit spread, we will be able to calculate the probability of default (PD). Loss given default (LGD) can also be derived under Merton framework. 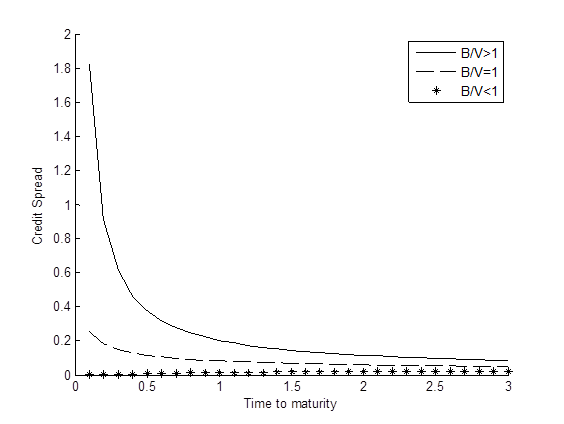 Graph below shows the term structures of credit spread under various scenarios for the leverage ratio (B/V). It’s worth mentioning that the Merton model usually underestimates credit spreads. 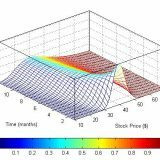 This is due to several factors such as the volatility risk premium, firm’s idiosyncratic risks and the assumptions embedded in the Merton model. This phenomenon is called the credit spread puzzle. Research is being conducted actively in order to improve the model. Merton, R. C. 1974, On the Pricing of Corporate Debt: The Risk Structure of Interest Rates, Journal of Finance, Vol. 29, pp. 449–470.